Am I ready to record? The Process - What happens in the studio and beyond? If I'd known you were coming, I'd have baked a tape! You feel inspired by those creative urges to record a milestone in musical history. You've written the songs... but, are you ready to record? Many a great song has missed its target because it is rushed or poorly prepared. Are there any weak points that can be rewritten? Is it in the best key to maximize your lead singer? Do I have all the right musicians and are they well rehearsed? If it doesn't sound good live, don't expect miracles in the studio even though many things will improve. Can I afford to do it right (pay peanuts and expect monkeys). A good recording can take quite a lot of hours to record, mix and master one song. Great musicians often take longer as they are more fussy with greater expectations. You have to live with the mistakes that are there at the end. More time getting a good rhythm bed down often speeds up the later takes as they can be built on a strong foundation. The "important" people that listen to your CD such as record company A&R managers and TV and radio selectors usually have little imagination and time. They are also swamped with good material, so yours needs to be the best it can be to stand out from the crowd. So if the answer is no to any of the above, consider waiting until you can do it right. When you finally make it into the studio be prepared for the eccentricities of the engineers and producers. Each will have there own way of achieving the best results using methods that might only make sense to the enlightened few. The main process can summarized in four basic steps. Tracking: During this time the various instruments are recorded to tracks on a multi-track recording machine (multi-track tape recorder, computer, digital workstation etc.). Instruments may be recorded one at a time or all at once depending on the preferred method. This is the main step that most musicians see. The Engineer's job is mainly trying to get the best performance out of the performer with the optimum recording levels on their machine. This is usually also the longest step which can last for days, weeks or years depending on budgets. Mixing: During this step the numerous tracks of a song on the multi-track are combined together into a stereo, mono, and/or 5.1 mix. For CD production the stereo mix is the one mostly used. The majority of effects (reverb, echo, compression etc.) are added at this point and the relative volumes of each instrument are set. The mixing process can be done onto numerous formats eg: onto ¼ or ½ inch tape, cassette, DAT, mini-disc or even directly to CD. This step should not be rushed. Mastering: Unfortunately, this step is sometimes left out. This step involves preparing the mix for the CD. The order of the songs is sorted out here. The starts and endings are cleaned up and the amount of time between songs is decided. Sometimes more global effects such as compression and reverb are added and the tonal balance adjusted to compensate for losses when converting to the digital format of the CD. This is a step which can bring out the best or worst in a song and so is best done by a very experienced engineer. Sometimes a specialist Mastering Engineer is used at this point. Mass Production: The mastered CD and Artwork are sent away to be copied and packaged. This step is the hardest to control time-wise as small orders (500-1000) may be shelved until larger orders are done. This happens particularly towards the end of the year when all the big names (Britney Spears, Perry Como, Rolf Harris) are trying to get their Xmas albums out. Though few bands do, it's also a good idea to wait until you have your CDs before announcing the CD launch date! A lot of time can be lost while waiting for Artwork so try and get that finished before the CD is mastered. A positive attitude is infectious. Everyone wants a great CD, to do their best and have a fun time in the studio. Encourage each other and be patient. There will be spots where everyone will have difficulties, including yourself. If you help each other through these times, a better result can be achieved. If you need to do a take a few more times to get it right; do so, the engineer won't mind. He's paid by the hour. If you feel you've done your best, say so. Engineers can't read minds yet. You have to live with the mistakes. Listen for mistakes and politely point them out so they can be fixed. It saves time and gives a better result. I want to sound like Rolf Harris. If you have a particular sound that you want to emulate, bring a CD of that style in case the Engineer hasn't heard your favourite band. It will save a lot of time. Know your songs well. The studio is the most expensive environment in which to write, learn, or arrange your parts, so be well rehearsed before recording. Come prepared. Think of all that you will need for the session (pens, paper, charts, plectrums, lunch etc.). Have a copy of your chart for the engineer. It helps speed things up. Have spare strings, leads, drum skins, and sticks in case any break. Do you need extra music stands? Give me a break, fellas! As each round of musicians finish their parts and come out to relax, remember the engineer. He also needs occasional breaks and does a better job after them. Too many cooks spoil the broth. Work out early who has the final say in things, so that arguments and friction are reduced to a bearable minimum. Everyone has a bad day! The tapes won't go bad, so if your having an off day try and slot someone else into your spot and try again later. That would have been great if it was in tune! Guitars and basses should have new strings (if affordable) as the harmonics are more likely to be in tune. Fret buzz is really noticeable when recorded, so don't have the strings too low on the action. All instruments should be checked for tuning before each take, in case of drift. Tune all instruments off the one tuner as they also can vary slightly. Let's hum a few bars. Cheap guitar leads and effects pedals are notorious for hum, so keep leads short and effects down to a minimum, or use a good quality unit. Remember effects can't be removed but can be added later, so don't overdo them. Excuse me! Avoid gas producing foods. The human body can produce a large number of involuntary sounds which all record well. The noises on each track are additive so be careful, as your songs might end up sounding like a Beer & Beans Fest when combining 24 tracks together. It's not over till it's over. While the tape is rolling don't make any excess noise by moving, yawning, talking or worse. Be particularly quiet during and after the ending. Smoking Kills! Nicotine in smoke erodes the gold capsules in expensive microphones and could lead to premature death if the Engineers see this happening. It also makes the recording environment smell like a stale ashtray, so leave the bad habits outside. And remember, recording can be fun - so enjoy yourself! So you now have all the songs recorded onto your 2 inch tapes as well as your stereo mixes on ¼ inch tapes. The CD master has been sent away to be duplicated and you're wondering what to do with your valuable tapes. If you score a recording contract the record company may want to buy your old tapes to remix with their favourite producer and a mega budget in the USA. You might also at a later date decide to reissue a song with a different mix or even add or subtract a few parts. You need the 2 inch tapes for this. You may even decide to record your next album over them to save money. They also make lovely bookends. So how to store them is important. Tapes are best kept in dry air conditioned environments away from electrical or magnetic fields such as speakers. A metal cabinet is good for this. The tapes store best tail out (you have to rewind the tape before you can play it) and standing upright. They can still go flaky after five or so years from moisture, they are after all just expensive rust stuck on a plastic strip. If you have very old tapes and decide to play them, it may be best to have them baked first before playing them. This is a slow process where the tapes are heated at various temperatures for a few hours. A copy should then be made on the first playing of the tape. An alternative idea is to store the tracks after a few years on a CD, DVD or similar at the highest bit and sample rate you can (eg. 24 bit, 96khz.) so that you don't lose too much of that analogue information [read section on Analogue vs. digital]. Sound is produced by the continuous vibration of an object such as a guitar string or a speaker. The theoretical limits of the range of human hearing are from twenty vibrations a second to twenty thousand vibrations a second. The unit given to vibrations a second is the hertz or its abbreviation Hz. One thousand vibrations a second is known as a kilohertz which is abbreviated to kHz. In analogue circuitry, the continuous vibration is converted to a continuous electrical signal which gives a very good representation of the sound (excluding any colouration or distortion introduced in the circuit). In the digital domain which is essentially a pile of numbers (which would confuse most accountants), the continuous sound wave is chopped up at regular intervals (known as the sample rate) and the size of the wave measured. The wave is more accurately represented if the sample rate is higher. The accuracy of the measurement is determined by the bit rate ( the higher the bit rate the more accurate the measurement). The average CD is a digital recording in which the sound wave is measured 44 100 times a second (44.1kHz sample rate) and the size of these measurements is stored as a 16 bit number, which is like using a ruler with 65 536 (2 to the power of 16) separate divisions. The average DAT recorder also uses a 16 bit ruler but has a higher sample rate of 48 000 times per second (48 kHz). One can see from this that a high note of 20 000 Hz (or 20kHz) at the theoretical top of the range of human hearing would only be measured at two points with a sample rate of 40kHz whereas a low note at 20 Hz would be measured 2 000 times giving a much more accurate representation of its shape. High end digital equipment tends to be better by measuring much more often with a sample rate of 96 000 Hz (or 96kHz). This not only gives a better representation of the note's wave shape but also means that approximately an extra octave of notes above the human range of hearing can be recorded ( more on this later). This equipment also uses a 24 bit ruler which is much more accurate for measuring the wave height, to be exact 256 times finer measurements can be done than with 16 bit. So what does all this mean for the musician??? Analogue recording is more accurate as it reproduces the entire shape of the wave, whereas the digital recording represents the wave as a series of steps. The higher that the digital sample and bit rates are, the closer they come to representing the analogue wave and the fine detail of its harmonics etc. It would seem therefore that it would be better to record with analogue rather than digital recorders. In many cases with top equipment this is the case. Many top bands still prefer analogue gear. Guitarists usually have class A analogue amplifiers if they can afford them ( Vox AC30, Soldano etc.). However no matter what way things are recorded they usually end up on CDs with a lousy 44.1kHz sample rate at 16 bits. So what's all the fuss about??? Firstly bad equipment whether analogue or digital sounds bad, so we're comparing the dearer stuff here. Again most guitarists when they play through an expensive digital pre-amp. find that it sounds like a mosquito in a tin can when compared to a good class A valve analogue amp. The digital box is cheaper however and usually has a lot more varieties of sounds packed into it which sound OK at a live gig ( but not in the studio, ie. many varieties of mosquitoes and brands of tin cans). Secondly, you might want to have a particular sound for your recording. A Culex mosquito in a Milo tin might do it for you. A cheap analogue amp with a rattling speaker might not sound as good as an expensive digital hybrid amplifier. This analogy can also be used when comparing analogue and digital drum kits etc. So when heading for the studio, take in the best gear you can beg borrow or steal. So What should I record with, digital or analogue??? A top end digital recorder (24 bit 96 kHz AD/DA converters) will sound better than a badly maintained analogue recorder with old tapes. 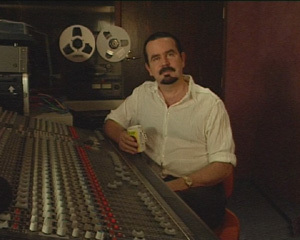 When recording to 2 inch analogue tape it will cost an extra AU$ 80 - $100 per song just for tape. Tape wears out with repeated tracking introducing noise and has a limited shelf life. Tape recorders also use up a lot more studio time with rewinding and fast forwarding whereas a digital recording doesn't wear and is much faster to work with and therefore cheaper. Analogue Equalizers (EQs) such as Amek, Avalon, Pultec and Neve are much better than digital EQs no matter what the salesman tells you. So although there are strong supporters of both analogue and digital equipment, for most bands seeking to record, a studio with good mikes and a good mixer such as Amek, Neve or SSL etc. and good outboard gear will produce a great sound ( when engineered well) whether one records onto analogue tape or digitally using 24bit 96kHz converters. Either way, to maintain the most information and interaction with high harmonics etc. it is best to convert to the CD format at the very last point in the mastering of your CD. Some engineers and other lesser creatures such as dogs claim to hear differences in frequencies much higher than 20kHz. The good news now is that an enhanced format on DVDs is being pursued which can be mastered at the higher quality 24 bit 96 kHz sampling rate which sounds much better and will make your dog's day.